ACE Quality Assurance instruments will assist many industries from growers, processing, packhouses, wholesale distribution centres and anyone who needs to ensure their fresh produce or food is quality controlled. We can source many instruments which may not appear on our website, so please enquire. Ace is the UK distributor for the GUSS Fruit Texture Analyser (FTA) from South Africa which is a valuable tool in the fruit industry. The Bareiss Fruit Testers are available in analogue and digital versions. The spring characteristics are like the 'SHORE A' measuring range with scale graduation from 1-100 units (with 1 being very soft and 100 being very hard). The digital model has constant pressure force applied to the fruit during the test, and an acoustic sound confirms that the "3 secs" test has been completed. ACE offers an extensive range of certified Brix solution standards, of the highest quality, from certified traceable materials. They constitute true 'Brix' standards suitable for the verification of both refractometers and densitometers. Our service and repair dept can arrange for all instruments to be serviced, repaired or calibrated. The FTA measures fruit firmness at the push of a button and captures the results to PC. Tests are conducted at standards depths and speeds of penetration, ensuring accurate and repeatable results. Complete with software, which can be configured to allow for customised output data. This enables the FTA readings to be incorporated into existing quality control systems. Test: apples, pears, peaches, nectarines, avocadoes, kiwi-fruit with quick, easy and reliable results. Also known as the Fruit Pressure Tester, our range of penetrometers measure the firmness of fruit quickly and accurately. 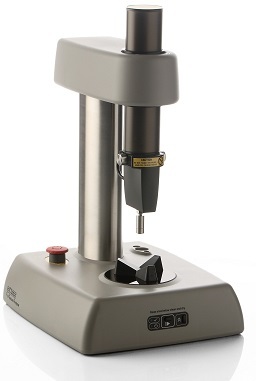 The unit can be used as a hand held instrument or mounted on a test stand for more precise measurements. 4 models available: FT444, FT327, FT011, FT01. ACE provides a choice of 3 'standard' penetrometer test kits, which are ideal for frequent checking between annual recalibration. Other instruments can be added to make a tailor-made kit which is essential for in-house QA Depts. ACE offers a range of quality control vinyl printed tapes to assist meeting the requirements of ISO 9000. All tapes can be used by hand or alternatively using our hand-held tape guns. ACE supplies a range of hand-held refractometers from Atago, including the Master M, Master alpha, and the revolutionary 'pocket' digital PAL-1, PAL-2 and PAL3. Atago is a worldwide name in manufacturing refractometers of cutting edge technology with quality and proven reliability. Atago will have the solution to your Brix measurement requirements. For those customers with budget in mind, ACE offers both digital and manual refractometers. Sizing devices available in wipe clean polypropylene material. Sizing rings, plates and strips can be manufactured to customer requirements. The adjustable produce sizing band is one of our most popular. Alternatively, the electronic ordial callipers are used widely throughout the produce industry to check quality sizing. Offering a full range of temperature recording equipment from E.T.I. and Digitron including contact and non-contact thermometers, probes, dataloggers, hygrometers, pH meters and moisturemeters. Full E.T.I brochures available on request.